Hey there... welcome! The layout I am sharing with you today was made for an event in Spain called ScrapLabMadrid. I was asked to create a layout that focused mainly on the paper and to also embellish using paper. This is what I came up with! 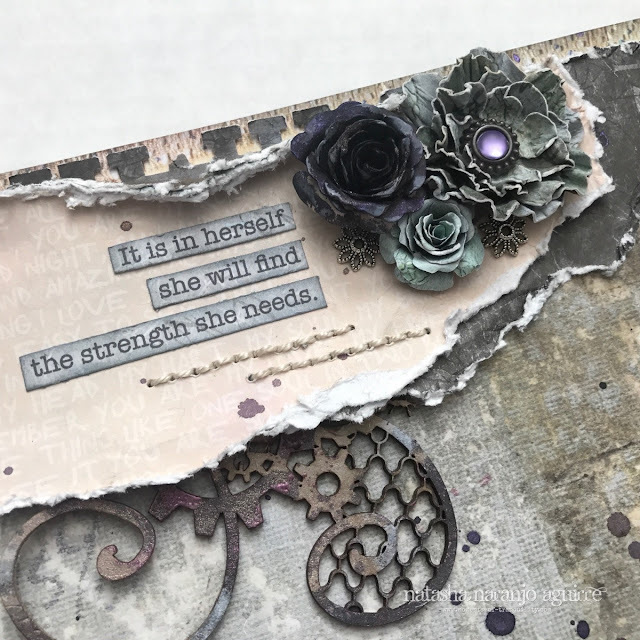 For this layout I used papers from various (older) collections by 7 Dots Studios. I love mixing paper collections because I feel that there are more creative possibilities. I generally choose a color theme first and then search for coordinating papers based on that. In this case I went with cool-toned neutrals and grays with a hint of peach and pops of purple. 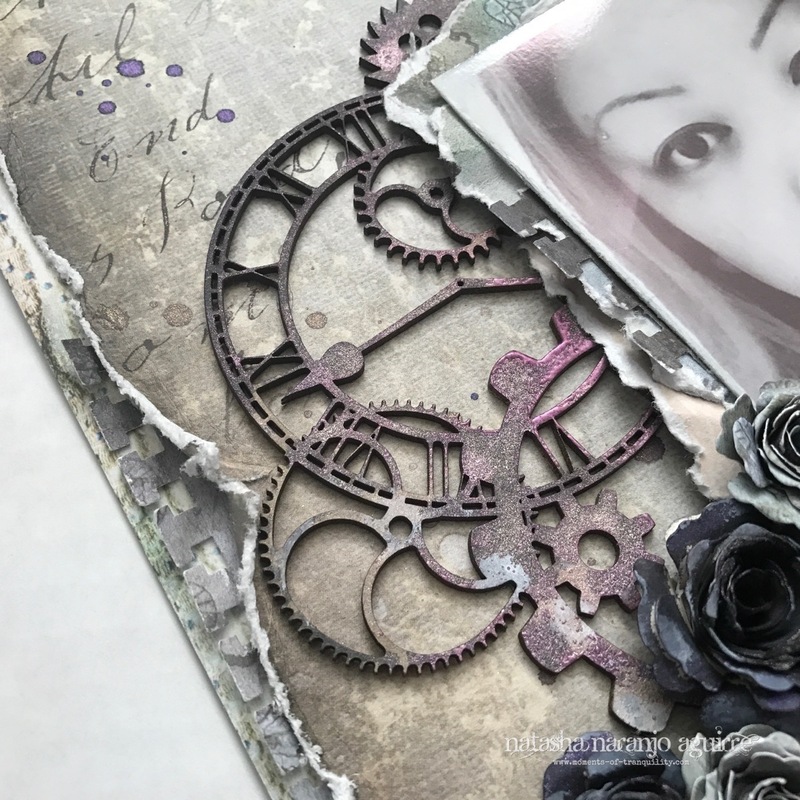 The simplest way to add interest to any layout using paper is to add layers! I tore up a few sheets, distressed the edges and adhered the layers to the top and bottom of my page. Along the outer border, I tucked punched paper beneath the layers. The random stitching helps to add texture to the layout, and the purple ink splatters help to bring my color scheme together. Here you can get a glimpse of the bottom layers as well as the gorgeous chipboard scrolls I added. The Dusty Attic scrolls (DA1542 Industrial Scrolls) were inked with several different colors and embossed using powder by Lindy's Stamp Gang. I love how they turned out! All of the flowers on this layout were made by hand using paper that was cut with Bitty Blossoms and Rose Creations dies by Donna Salazar. These are my all-time favorite dies for flower making. An easy way to create a photo mat for your photo is to stack layers of leftover paper and punched paper (also made from scraps). A quick tip for adding depth to the photo mat is to crumple up the layers before stacking them. And finally, to balance the design out, I added a Cog Cluster (DA1393) beneath the photo. This was a simple, yet fun project and I hope you like it. You can purchase Dusty Attic chipboard HERE, and if the design you are looking for happens to be out of stock, you can place a special order HERE. Be sure to follow me on Facebook where I post giveaways that almost always include Dusty Attic chipboard! Thanks for stopping by. See you next time! The layout came together so beautifully. Love your work.